Convergence of Political Parties represents an advance in Jamaica’s Political Leadership – DK Duncan — UTech, Ja. Dr. DK Duncan, veteran politician delivering the 5th annual Joan Duncan Memorial Lecture on the topic, “Political Leadership: An Enabler or Disabler to Jamaica’s Economic Growth,” hosted by the Joan Duncan School of Entrepreneurship, Ethics and Leadership (JDSEEL) at the University of Technology, Jamaica on Wednesday, May 16, 2018 at the University’s Papine Campus. Veteran politician Dr. DK Duncan has commended the leadership of both of Jamaica’s two main political parties for efforts being made in some areas, for the convergence of ideas and policy implementation in support of the country’s growth and development. “We have had the situation in Jamaica of some 40 years of anaemic growth, but what I think is encouraging at this time is that there seems to be a convergence between the two political parties on some fundamentals in relation to macro-economic stability, which is necessary for growth to occur at some time. 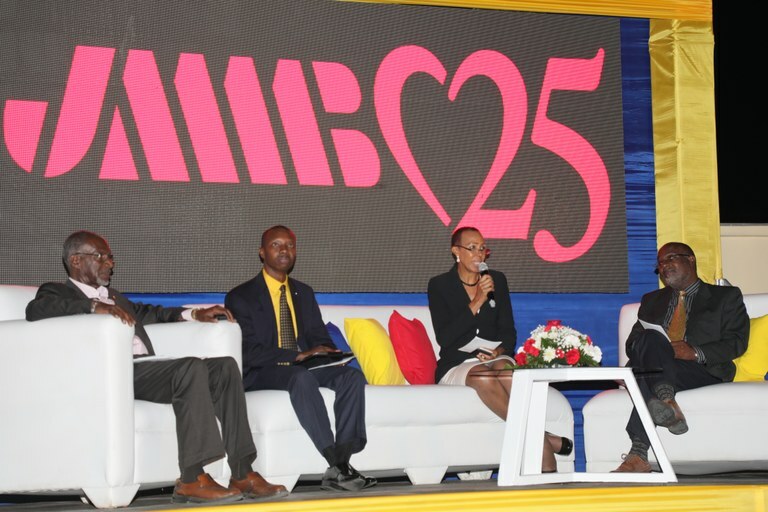 This has not been so for many, many years,” he said speaking in relation to the continuation of an economic reform programme started under the previous government administration. 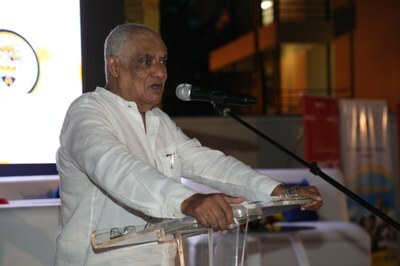 Speaking from his lived experiences in representational politics, Dr. Duncan painted a picture of Jamaica’s modern political history and culture which he acknowledged has been punctuated by periods of fractious tribalism, fuelled by political behaviour on both sides which have retarded growth. He cited the example of distribution of housing in a partisan way in the 1970s when under the PNP, houses were built in Arnett Gardens through the Ministry of Housing and to a large extent were populated by PNP supporters and a few years prior to that the ruling JLP Party built the housing scheme, Tivoli Gardens occupied largely by JLP supporters. Dr. Duncan however, pointed to “corrective measures” which he noted have been put in place by the political leadership of the day to solve some of the negative aspects of that political culture. Among these he noted, was the establishment of the National Housing Trust (NHT) in 1976 under the leadership of Michael Manley, as a real response. The veteran politician reasoned that more efforts around convergence in the administration of government will lead to Jamaica’s growth. “ Some of the efforts that we have to make I think is to see how that united approach around certain elements of the economy can be stretched to certain areas of the social sector so growth figures may once again look as good as they did in the late 1950s and 60s,” he concluded. The Lecture was chaired by Mr. Michael Steele, Head of the Joan Duncan School of Entrepreneurship, Ethics and Leadership, (JDSEEL) who highlighted the role of entrepreneurship as “an invaluable tool in the arsenal of a country’s development strategy.” He pointed to the work being accomplished by the JDSEEL at UTech, Jamaica in that regard in training persons who are desirous of starting their own businesses to contribute to solving the problem of high unemployment. Rev. Jeffery Shuttleworth, (2nd left) Pastor, Tarrant Baptist Church responds to a question from Moderator Dr. Carol Archer (left), Associate Professor, Faculty of The Built Environment. Looking on are other panellists (l-r) Mr. Don Anderson, Chief Executive Officer and Chairman, Market Research Limited, The Honourabe Fayval Williams, MP, Minister Without Portfolio in the Ministry of Finance and the Public Service, Mr. Fitz Jackson, MP, Chairman of the People’s National Party (PNP) and Opposition Spokesperson on National Security and Dr. DK Duncan who delivered the 5th Annual Joan Duncan Memorial Lecture. The main presentation was followed by a panel discussion elaborating on the theme, with moderator, Dr. Carol Archer, Associate Professor, Faculty of The Built Environment. Minister Williams in her contribution supported Dr. Duncan’s call for more convergence of ideas and policies in government. She noted that “when parties go into power they tend to want to reverse policies. They tend not to want to continue things that the other side started and so you get a lot of energy being spent reversing things trying to put something new in place and its time, energy and money that is lost.” The Minister commended the example of good policy continuity with the most recent IMF agreement programme. 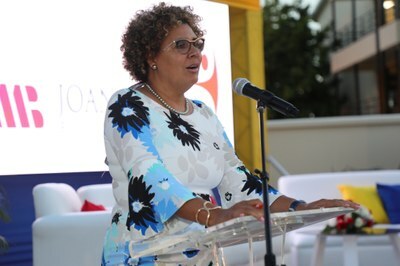 “We did not spend time saying we are going to try to re-negotiate the programme, we came in picked up, moved on because we recognized the power of confidence when people have confidence in the economy,” she asserted. The point was supported by Mr. Fitz Jackson who stressed the need for more entrepreneurs in politics with the bold courage to move ideas into implementation. A robust question and answer session involving the large audience of members of the business community, government, human rights advocates, educators and students, followed the discussions. A Family Affair: L-R: Dr. Khia Josina Duncan, medical doctor and daughter of Dr. D.K. 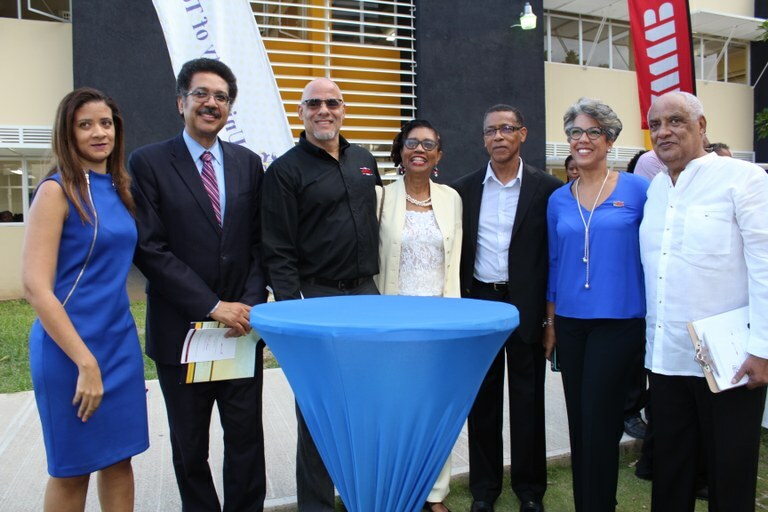 Duncan, Professor Stephen Vasciannie, President, UTech, Jamaica, Mr. Keith Duncan, CEO, JMMB Group, Mrs. Beverly Manley Duncan, wife of Dr. D. K. Duncan, Dr. Archibald Campbell, Chairman, JMMB Group, Mrs. Kim Mair, CEO, JMMB Joan Duncan Foundation and Dr. D. K Duncan, former Cabinet Minister, former Member of Parliament and former General Secretary of the People’s National Party. President Professor Stephen Vasciannie (left) shares pleasantries with some members of the planning committee for the 5th annual Joan Duncan Memorial Lecture, Mrs. Kim Mair, CEO, JMMB Joan Duncan Foundation, Mr. 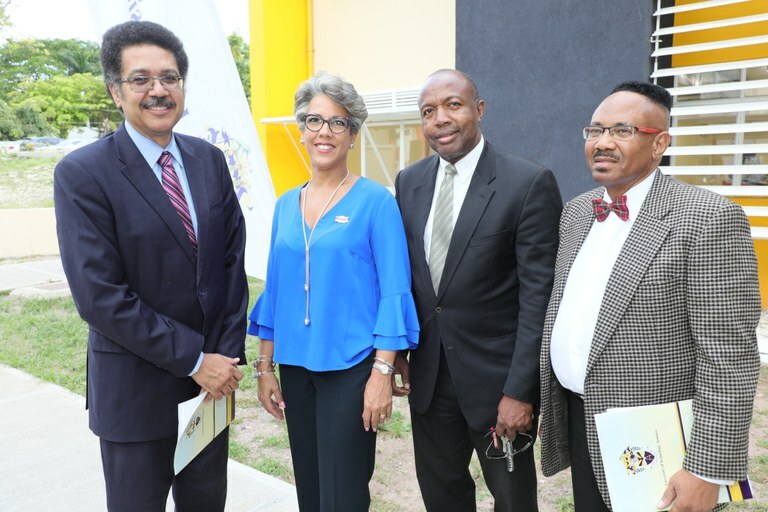 Prince Graham-Haynes, Lecturer, JDSEEL and Mr. Michael Steele, Head, JDSEEL and Chairman of the planning committee. 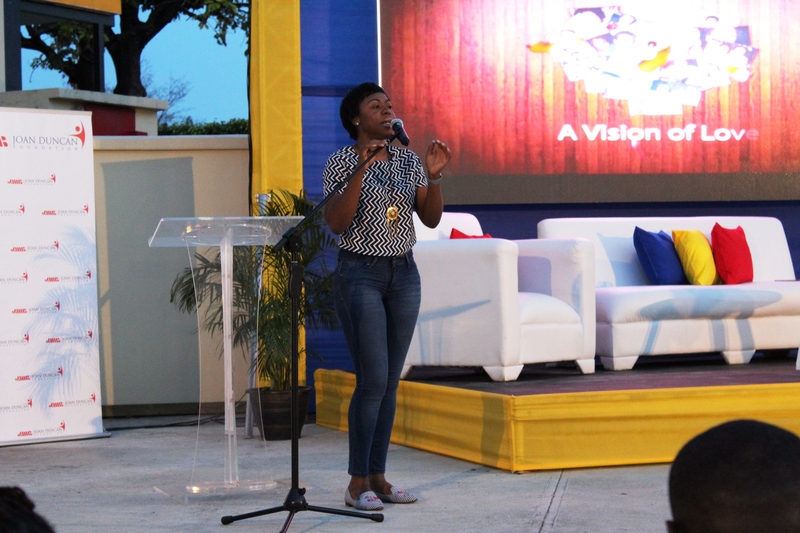 Tribute in Love: Nickiesha Barnes, former Rising Star contestant performing a medley of love themed songs in tribute to the late Joan Duncan.